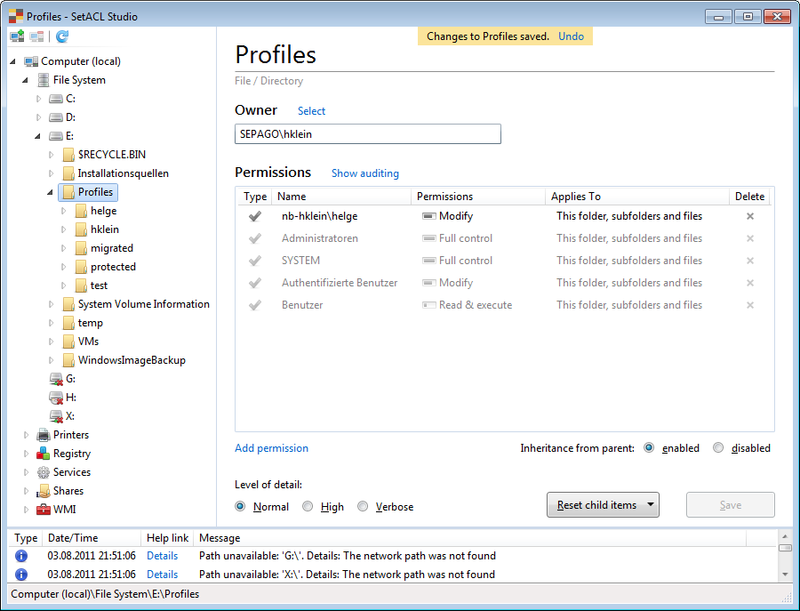 SetACL Studio is a management tool for nearly every aspect of Windows permissions. It works with the file system, the registry, printers, services, shares and WMI objects. It supports very long paths (the kind Explorer cannot handle) and shows you every corner of the system, regardless of current permissions. About all that I have written before. It now has undo. A simple text editor without undo is unthinkable, but systems management tools with undo are practically nonexistent. That changes today. You will never want to miss the comfort of that little function again. It is available. I am happy to announce that SetACL Studio has reached public beta status. If you notice anything that might be a bug please post it in the forum. Windows XP / Server 2003 or newer with .NET framework 4.0 client profile (a version of .NET that is slightly smaller than the full framework). SetACL Studio runs as a 64-bit process on 64-bit Windows and as a 32-bit process on 32-bit Windows so there are no hidden areas in the system it cannot get to. SetACL Studio works on all Windows languages. It comes with English and German localization and adapts to the operating system language automatically. Wow – it’s happening! I remember you mentioning the idea at PubForum. Can’t wait to try it. I can provide you with a Portuguese (Brazil) translation of your program for a small fee. Please don’t hesitate to contact me if you want to add this language to your product’s roster.